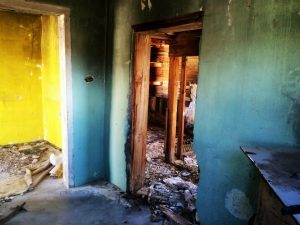 Exploring the desert, you sometimes encounter forgotten structures, be it former homes, industrial mill sites like Goldome, or old miner’s shacks. 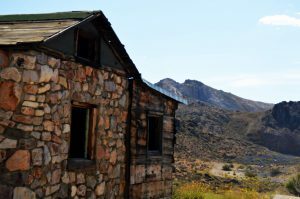 The Fluorspar Cabin, found near Beatty, Nevada, is one of the latter. It is clearly old, it has been there possibly close to a century, and is in pretty good condition for something left to the dust and wind. As it turns out, the Fluorspar Cabin is known as being a relic of a former fluorspar mine. The mine has gone by a variety of different names over the years, but the Daisy Mine is the one that stuck. It was originally coined the Daisy Fluorspar Mine, later the Crowell Mine in honor of the founders, and most recently the Daisy Gold Mine. No matter what you call it, production at the mine began in 1919 by Continental Fluorspar Co. and the cabin may date to around that time. The original owner and operator of the mine was J. Irving Crowell, however he transferred the mine to his son, J. Irving Crowell, Jr. in 1927. It was actively mined until 1988, and after a brief pause, resumed operations from 1997-2001 after a strain of ore was discovered. It has been inactive for fifteen years now and is not likely to be revived. Over the years, uranium, mercury, and arsenic were also mined there in smaller quantities. The history seemed rather cut and dry until I stumbled across an interview with Crowell Jr. from the Beatty Museum’s archives. The human side of any story is of course the most interesting. Crowell Sr. came out west from Cape Cod and worked in Rhyolite prior to purchasing the fluorspar mine. He worked the claim himself with the aid of an Italian friend named Louis Vidano. In 1923 he was suffered severe injuries, five hernias, plus a head injury from a railroad accident that forced him to stop operations at the mine. Crowell Jr. had to drop out of college, he was attending Stanford University at the time, and ended up reluctantly taking over operation of the mine. His wife, Dorothy, moved from Los Angeles to Beatty and the two lived there the rest of their lives. Their entire story can be found at beattymuseum.org. Fluorspar is not a well-known mineral, but it does have many different uses. More commonly known as fluorite, its crystals have been utilized for ornamental purposes since the Roman times and have been used in iron smelting for centuries. In our era, clear fluorite crystals are often used in making microscope and telescope lenses. Fluorite crystals make the best lenses for use within the ultraviolet and infrared light spectrums because they are exceptionally clear within those wavelengths and have minimal distortion. Canon Inc. actually grows their own synthetic fluorite crystals for their high-end telephoto lenses and Nikon also offers fluorite lenses and fluorite coated lenses. A less impressive but important use of fluorite is in cement mix, which is what this mine mostly produced it for. The cabin has definitely seen better days, but is holding up well. Although barely outside of Beatty, Fluorspar Canyon remains mostly a local’s secret. This mineral-rich region is quite stunning and has some interesting history to boot. The canyon makes for a nice, scenic detour from the well-traveled US 95. Getting to the cabin require driving up the canyon, which can be a worthwhile trek in its own right. The road along the canyon (I believe used to be the grade for the railroad) is unpaved but in very good condition. The cabin is on the right about three and a half miles back. For more about the Fluorspar Canyon, go to roadtripamerica.com.